October 2016 Newsletter – Starbucks Employees Take Action to Reduce Waste and Feed the Hungry | Dulles South Food Pantry, Inc. October 2016 Newsletter – Starbucks Employees Take Action to Reduce Waste and Feed the Hungry – Dulles South Food Pantry, Inc. The employees at the Starbucks in the Eastgate Shopping Center in South Riding Virginia aren’t just serving up Grande Iced Coconut Milk Mocha Macchiatos, they are serving up a helping hand to the local community. Every Wednesday morning, volunteers from the Dulles South Food Pantry stop by there to pick up fresh bakery items to distribute to Pantry guests later that day. Since the program began four months ago, Starbucks has donated over eighty pounds of food to the Pantry. 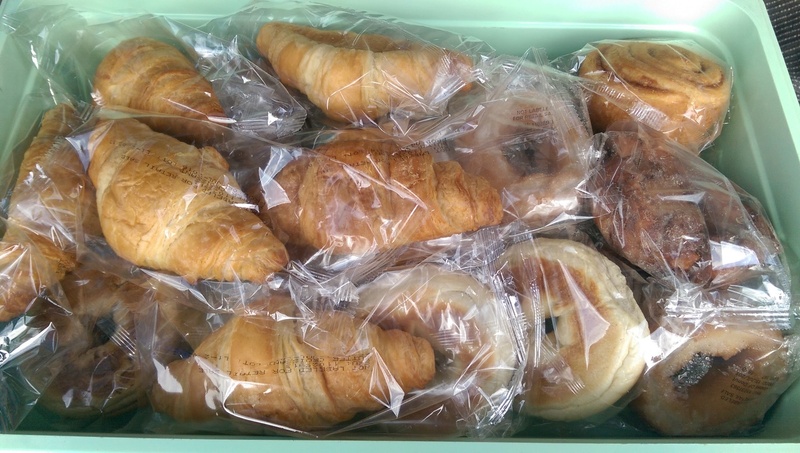 The items being donated range from bagels to banana bread to croissants. “These are a real treat for our guests. People struggling to make ends meet and put food on the table appreciate having fresh baked goods in addition to the canned food normally distributed by the Pantry”, explains Charlene Jones, Pantry President. The program began when employees, led by Jessie Johnson, saw good food going in the trash. With the support of store manager, Maria James and district manager, Evie Szafirska, Johnson contacted the Dulles South Food Pantry to see if the food could be used.